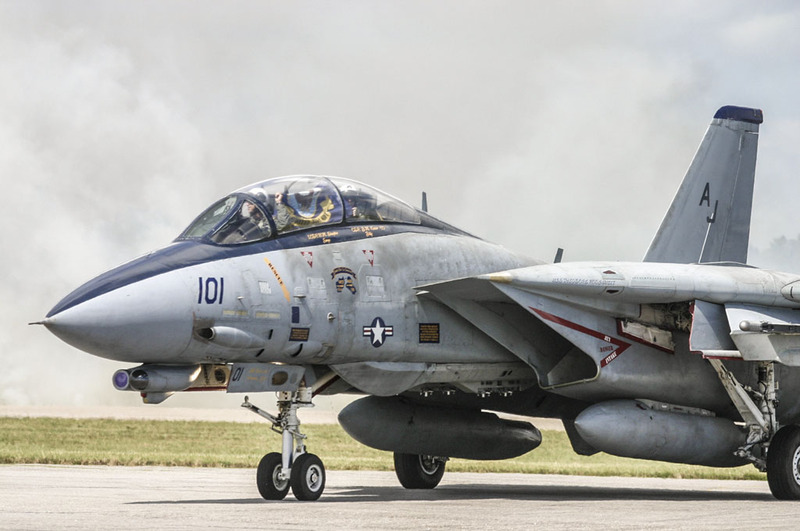 Tomcats capture all the glory days of Modern naval Aviation . I was fascinated by this “cat” after the movie ” Final Countdown” and when I 1st boarded the Aircraft Carrier USS Constellation CV-64 back in the 1980s. 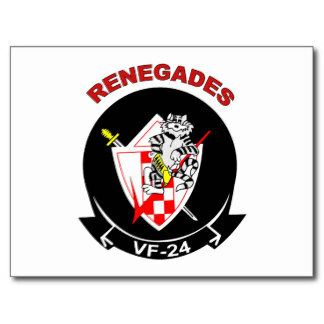 There were 2 squadrons of F14A on board namely the Fighting Checkmates VF-211and Fighting Renegades VF-24. This was followed by another Carrier than came to port USS Ranger CV-61 with VF-1 Wolfpacks and VF-2 Bounty Hunters. 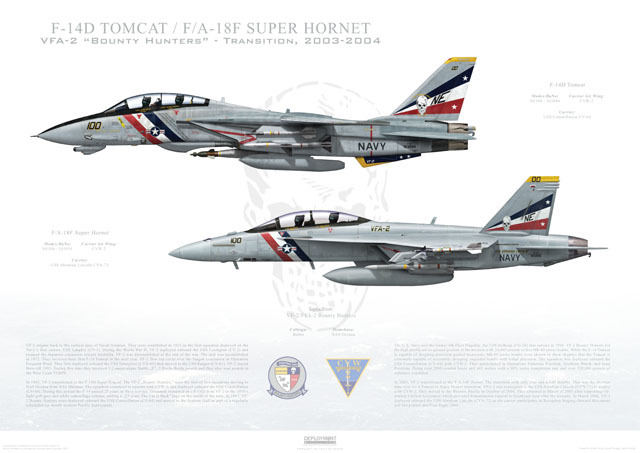 I can see that the F-18E/F superhornet is a more capable aircraft but from a pure perspective of esthetics the F-14 Rules…. Aviation enthusiasts, photographers and Scale aircraft modellers have had great topics of the squadron use on the US Navy Carrier air-wings. 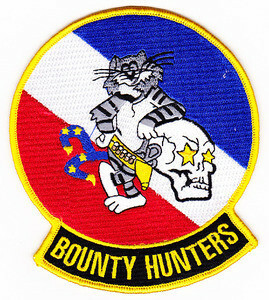 These Squadron also feature a following “cult” after the movie top gun with squadrons like Jolly Rogers, Tomcatters, Sundowners. 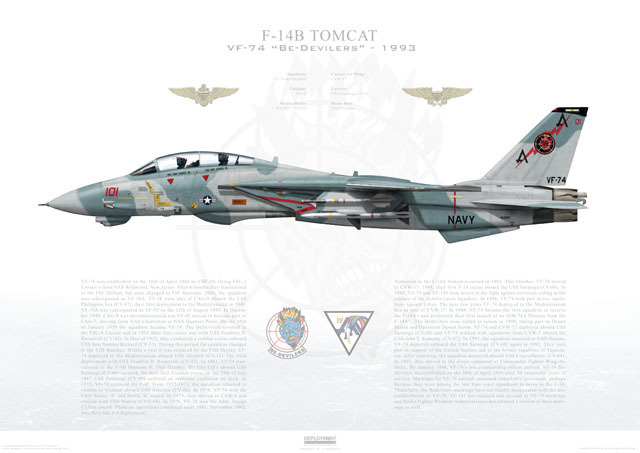 Unfortunately with the US Navy retiring the F-14 Tomcat in 2006, Iran is the sole operator of the Mighty tomcat. 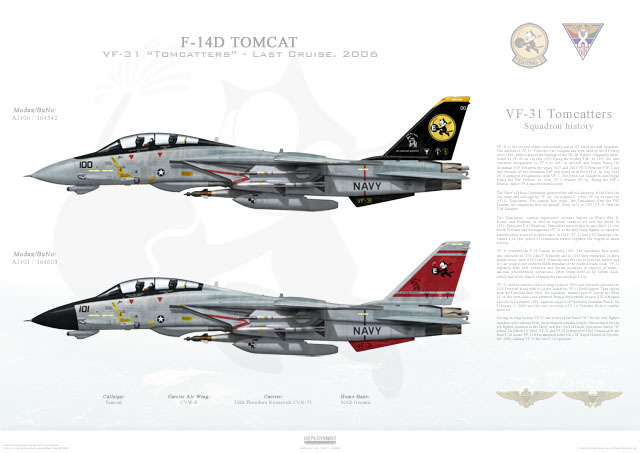 For all of us tomcat lovers, we can only see them in Air Museums and the bone yard in the Arizona desert. 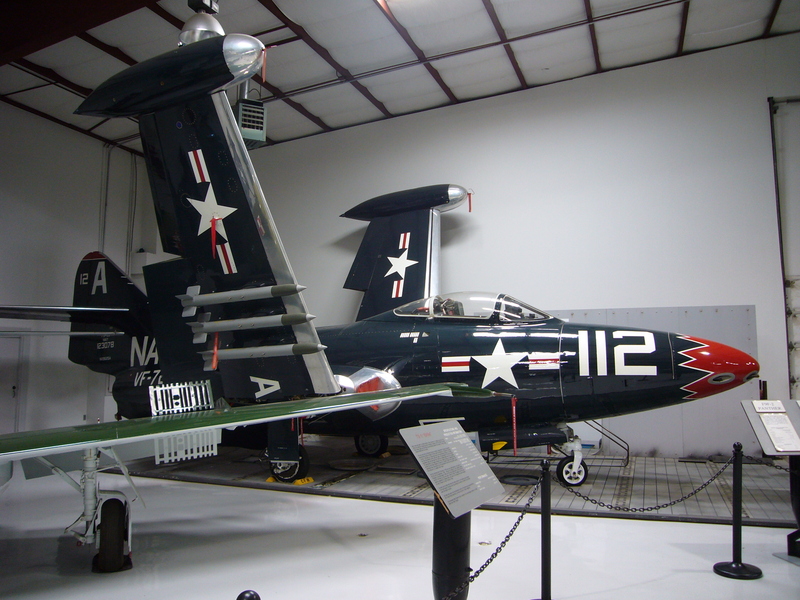 US Naval Aviation have the long tradition of putting very colorful markings after the 1950s when they transit from the Navy Blue aircrafts like the Bearcat, F-9 panther with a single color and monotonous looking combat aircraft. As you can see on the F9 panther that the markings were pretty much white on Blue. The introduction of F-8 Crusader, F-4 Phantom era we see the markings of Navy becoming very colorful with high gloss light grey and white camouflage aircraft with very colorful markings. This can be seen as shown on the Phantom pictures.This colorful era brought in so much interest that they is a long follower of the units, logos, gears, aviators and aircraft. 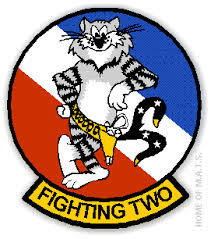 The US Naval F-14 Fighter Squadron structures in the following : as you can see the unit logos are very unique and catchy at times. The Logos sometimes reminds us of the cartoon character that we most familiar with. Felix the cat of VF-31 surely fits into that. 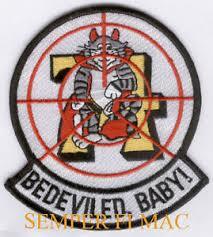 I truly belief the Tomcat era started with Final Countdown back in 1979 when Tomcat started to fill our Navy Carriers. The mere sight of freshly painted VF-84 Jolly Rogers and Black Aces VF-41 F14A and the entire Airwing of CVW-8 doing carrier operations. This is the memento scene of Final Countdown when CAG ( Commander Air Wing) commander Owens on his flight onto the Nimitz CVN-68. 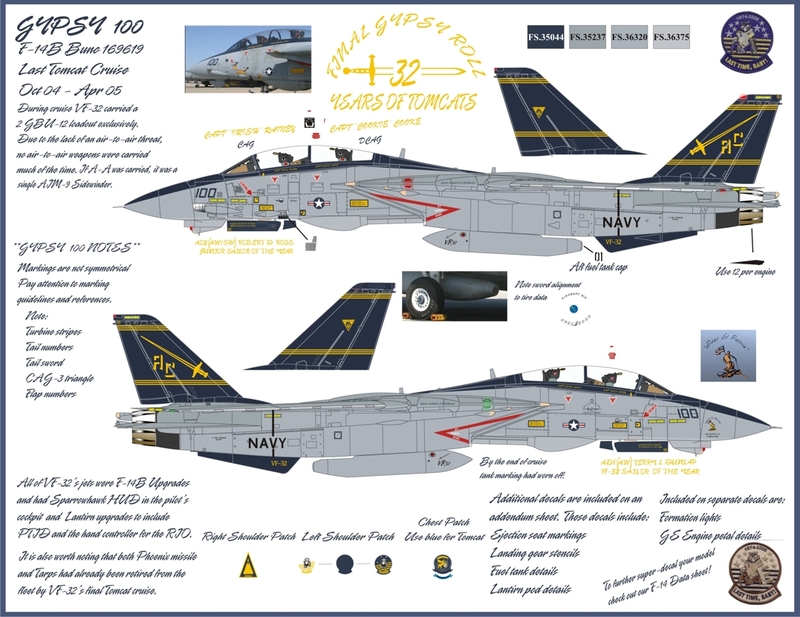 Top Gun would be the movie that put Naval Aviation in the spotlight. Maverick doing his “MIG-28” intercept and him attending Top gun training in NAS Miramar ( Fightertown) dog fighting Viper ( A-4F Aggressors ) in the desert. Although all the squadrons depicted in the movie was fictional but it still retains the actions, colors, icon of Naval aviation. 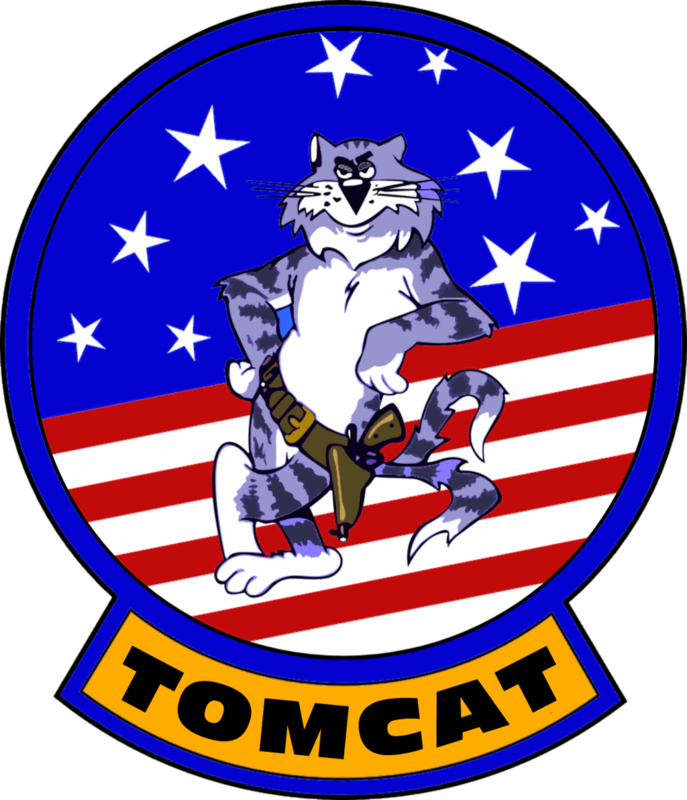 The Tomcat logo was more of a Hollywood type character showing a fat cat similar to the American Volunteer Group “Flying Tiger” logo. This brings out the character and putting life in this metal bird. 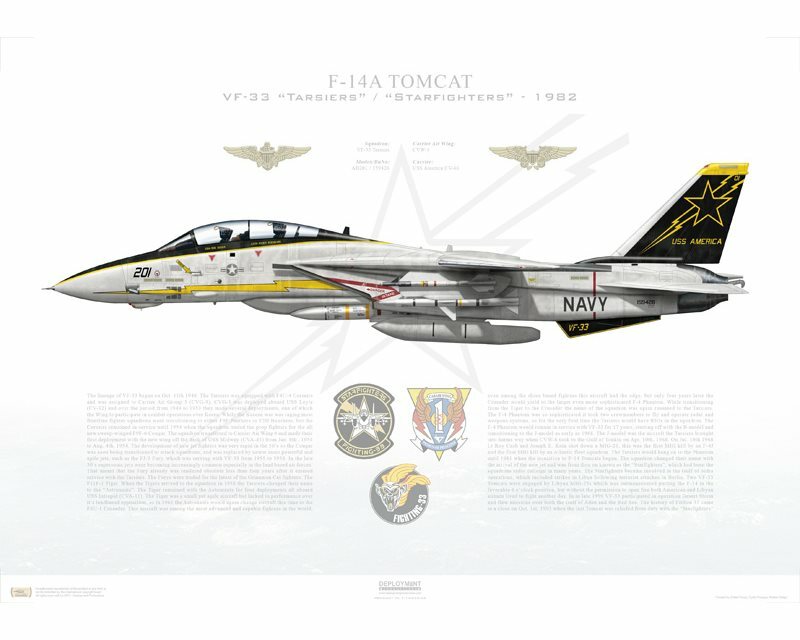 I would like to photo illustrate this Tomcat character with each corresponding Squadrons showing the glory days of F-14. 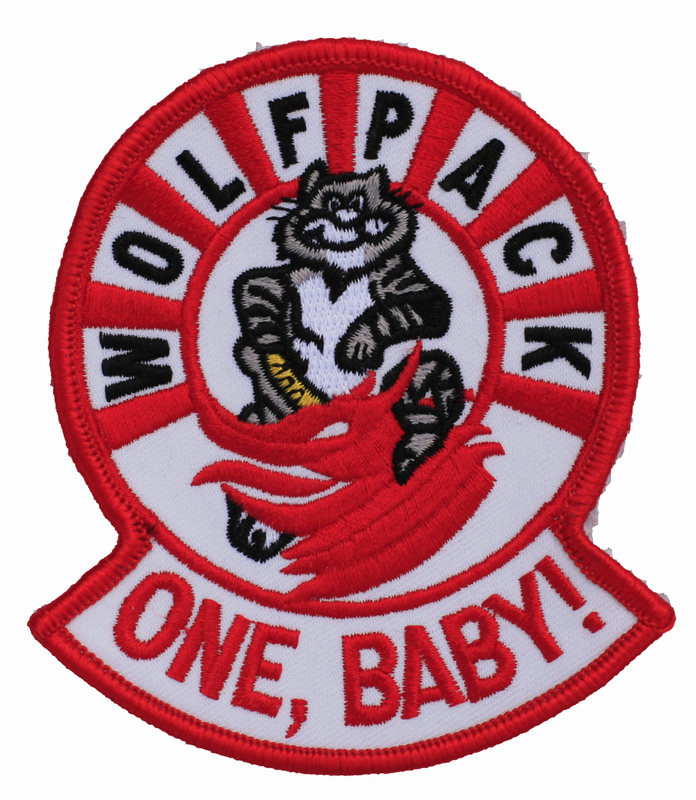 Wolfpacks was the 1st F-14 squadron on board USS Enterprise on her maiden deployment to Southeast Asia than ( Vietnam war) in 1974. 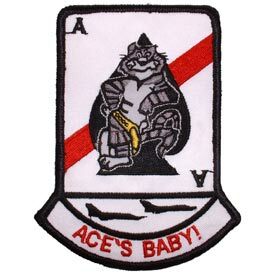 Callsign ” Wichita” VF-1 was actually scramble during the Fall of Saigon doing Combat air patrol in the Gulf for the evacuation of the city. It will be interesting to see an F-14 laiden in AIM-54A, AIM-7 and AIM-9 engaging North Vietnamese MIGs. This unit was deactivated in 1993. 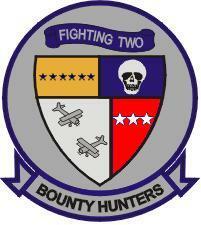 The Sister Squadron to VF-1. 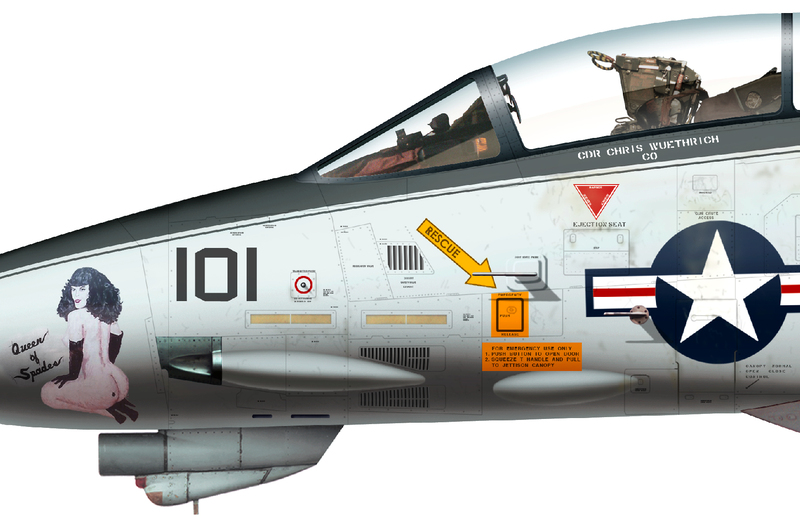 Callsign Bullet have the skull emblem on the tail with the famous red white and blue cutting diagonal on the front of the aircraft. A truly unique scheme and really brings out the aesthetics of an F-14. 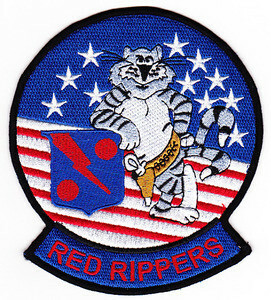 Red Ripper call sign Ripper is base in NAS Oceana. 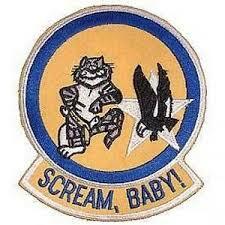 I was fortunate to have seen this squadron in action before they transit to the F-18F. Interesting story of how the Red Ripper came about. “The boar’s head is taken from the one that graces the label of the Gordon’s Gin bottle. The scroll effect under the head is a string of link sausage, a good line of bologna which all members of the squadron were to be adept at ‘shooting. The balls on the shield might be called balls of fire; actually, they were supposed to typify good, strong masculinity. The bolt of lightning was the bar sinister of bastardy. The whole theme was worked into a sort of toast or creed with which the squadron members were to begin and end all good drinking bouts. The official Ripper toast is, ‘Here’s to us, the RED RIPPERS – a damn bunch of gin drinking, bologna slinging, two-balled, he-man bastards’.”….. Interesting facts!!! Tophatters call sign Camelot is currently base in NAS Leemore CA. 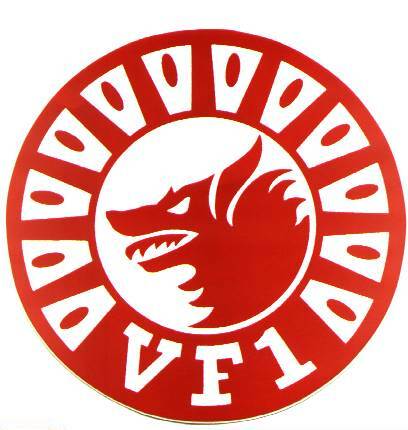 During its hay day of F-14, VF14 was base in NAS Miramar, CA. She holds the title of Navy’s oldest active squadron. The squadron adopted the classic Top Hat as its squadron patch and called themselves the “High Hats”. 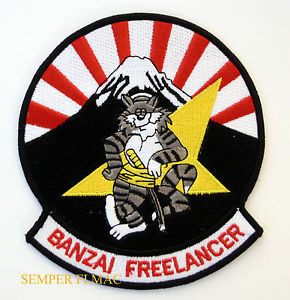 Freelancers call sign “Lance” is base in NAS Miramar, CA until 1996 when the unit was De-established. 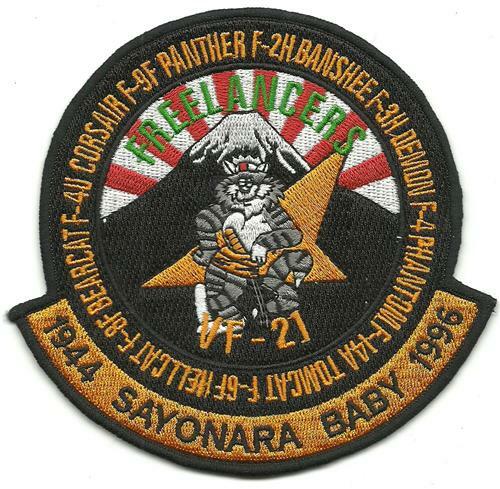 In 1991 VF21 was move to NAF Atsugi in Japan when USS Midway CV-41 was change over by USS Independence. The squadron stayed with USS Independence and moved air wings, from CVW-14 to CVW-5. This was, because the Midway air wing had been without Tomcats, as the older ship could not accommodate the F-14’s size and weight. Call sign “Rage” . 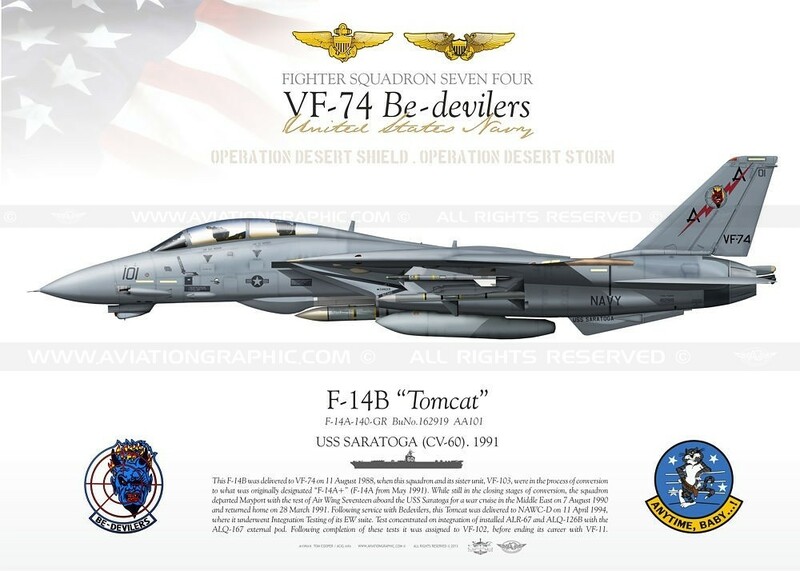 Squadron was established in 1957 and ended in 1996 flying the F-14D. I vaguely remember seeing this squadron several time in the 1980s when USS Constellation came to port. Sister squadron with the VF-211 Checkmates. 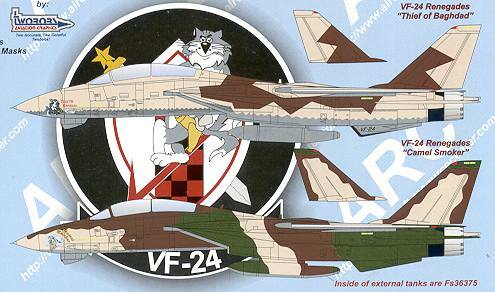 In her final days, VF-24 have the most elaborate camouflage scheme on the F-14…. ” Thief of Baghdad” testing dropping LGB and non guided iron bombs. 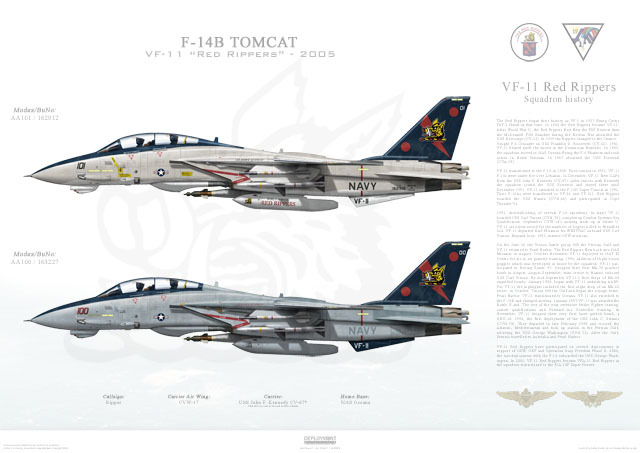 This is the tomcat of all tomcat squadron becasue VF-31 callsign is ” TOMCAT” or “Felix” she spot the cartoon character Felix the cat as her logo and flew to the last day of the Tomcat era in 2006 when F14 finally got retired. The Tomcatters are the second oldest Navy Fighter Attack squadron operating today after the Tophatter. 2006 marked the bow down of the F-14 and I was able to visit NAS Oceana for this faithful event. 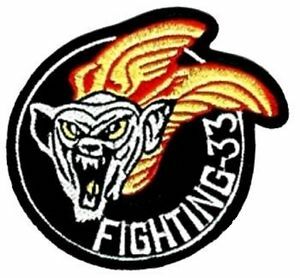 The Fighting Swordsman VF-32’s motto Deus et Patria (“God and Country”). Call sign “Gypsies”. The squadron picked up the nickname Swordsmen after it switched from the F-8 Crusader and added a sword to the lion’s hand. VF-33 got their F-14 ride along with VF-102 Diamondbacks in CVW-1 aboard CV-66 USS America. In 1987, they abandoned “Minky” and changed their name from Tarsiers to Starfighters, which was their radio callsign. 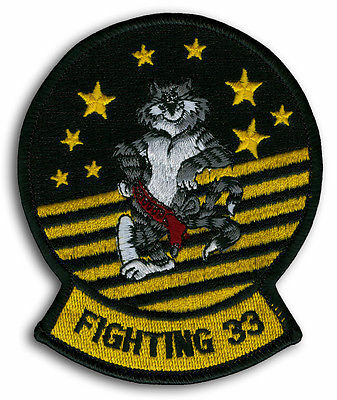 After the Cold war ended , VF-33 was not TARPS capable and despite the squadron’s success in Desert Storm, it was disestablished on 1 October 1993. 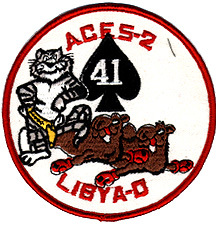 The Black Aces call sign Fast Eagle , sister squadron to VF-84 Jolly rogers back in the 1980s aboard USS Nimitz made the F-14 kill on the famous Gulf of Sidra incident in Aug 1981. 2 SU-22 from the Libyan AF engage 2 F-14A from VF-41 and in the melee, both SU22 was shot down with no F-14 losses. I still remember this incident just like it happen yesterday . 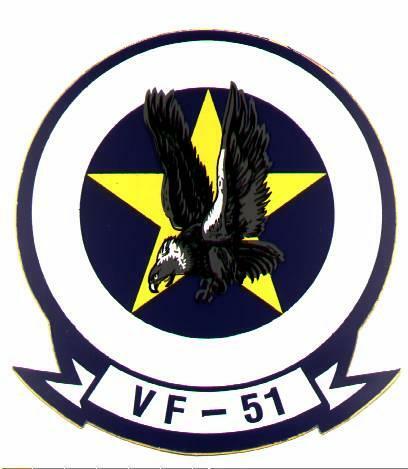 VF51 Screaming Eagles callsign Eagles. In 1985, VF-51 was one of several NAS Miramar based squadrons to participate in the filming of the movie Top Gun. Some VF-51 and VF-111 aircraft were repainted in fictitious squadron markings for the film. To be able to film the sequences, the F-14s were fitted with cameras mounted in pods attached to the underbelly Phoenix pallets and the under wing pylons, as well as using ground mounted cameras. 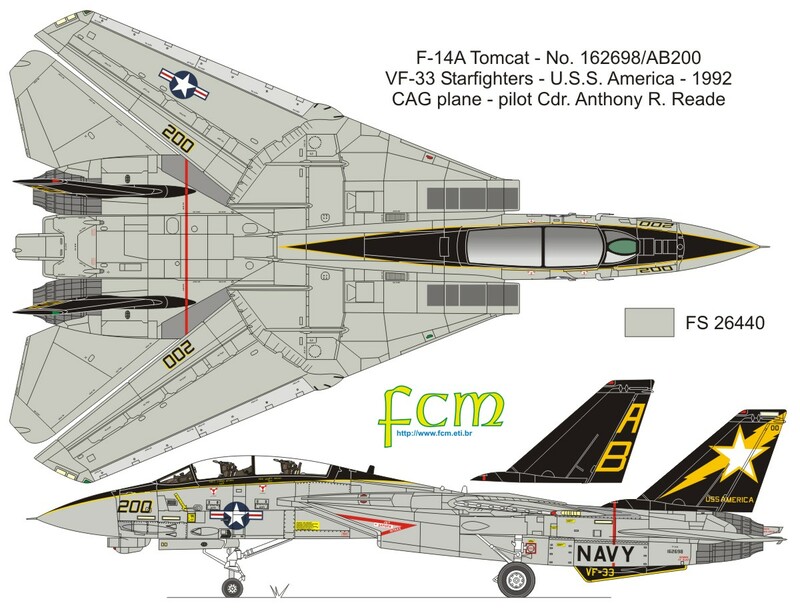 VF51 suppose to get her F-14D upgrade with sister squadron VF-111 but due to lack of budget and realignment, the squadron was established in Mar 1995. 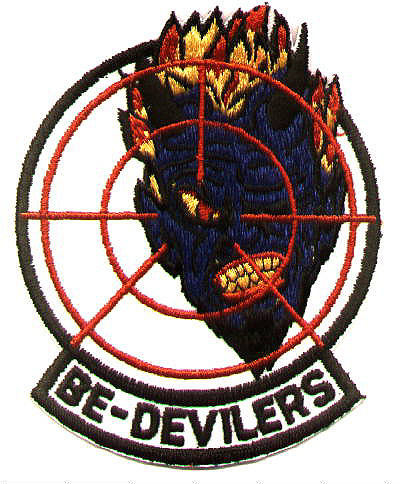 VF-74 Bedevilers call sign ” Devil” started their service in April 1944 flying F-4U Corsair. 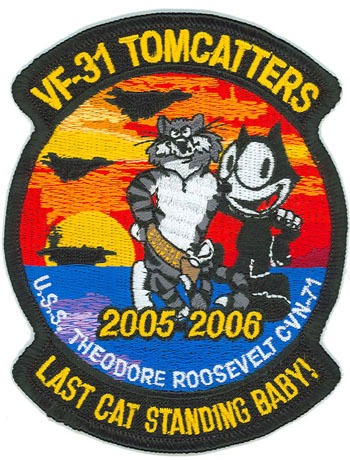 They got the tomcats in 1983 being assigned to CVW-17 on board USS Saratoga CV-60. Since VF-74 was not TARPS capable, they were drop from Carrier deployment and spent her last days flying aggressors for the Navy. They have some really elaborate camouflage schemes.